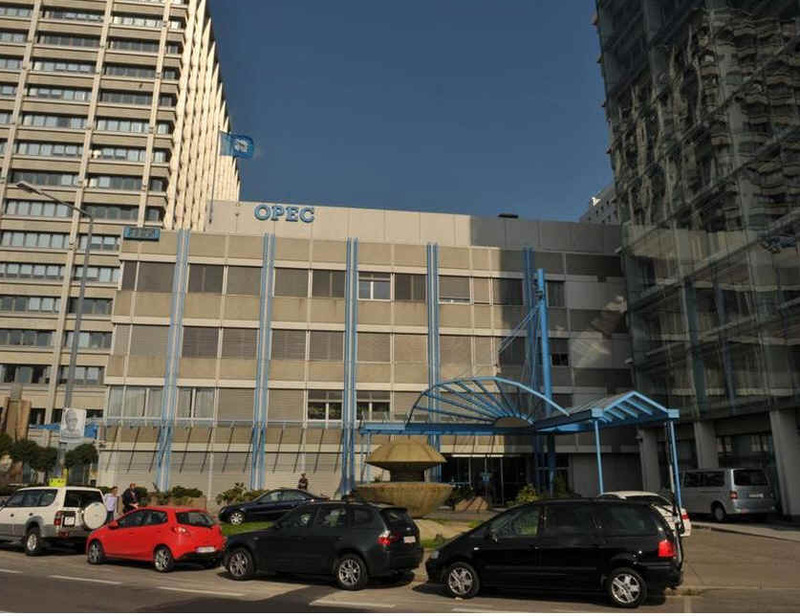 OPEC transferred its headquarters from Geneva, Switzerland, to Vienna, Austria, on 1 September 1965, and moved into the present Secretariat building in 1977. The OPEC MCs coordinate their oil production policies in order to help stabilize the oil market and to help oil producers achieve a reasonable rate of return on their investments. This policy is also designed to ensure that oil consumers continue to receive stable supplies of oil. The Ministers of the OPEC MCs responsible for energy and hydrocarbon affairs meet twice a year to review the status of the international oil market and the forecasts for the future in order to agree upon appropriate actions which will promote stability in the oil market. The MCs also hold other meetings at various levels of interest, including meetings of petroleum and economic experts, country representatives and special purpose bodies such as committees to address environmental affairs. Decisions about matching oil production to expected demand are taken at the Meeting of the OPEC Conference. The Secretary General is the legally authorized representative of the Organization and Chief Executive of the Secretariat. In this capacity, he administers the affairs of the Organization in accordance with the directions of the Board of Governors. The Conference appoints the Secretary General for a period of three years, the term of which may be renewed once for the same period. This appointment takes place upon nomination by Member Countries, and after a comparative study of the nominees’ qualifications . In the absence of a unanimous decision, the Secretary General is appointed on a rotation basis for a term of two years, without prejudice to the required qualifications. 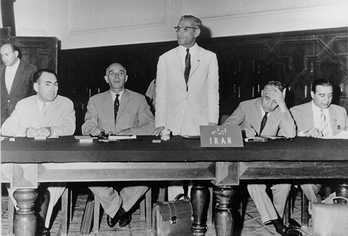 OPEC’s formation by five oil-producing developing countries in Baghdad in September 1960 occurred at a time of transition in the international economic and political landscape, with extensive decolonisation and the birth of many new independent states in the developing world. The international oil market was dominated by the “Seven Sisters” multinational companies and was largely separate from that of the former Soviet Union (FSU) and other centrally planned economies (CPEs). OPEC developed its collective vision, set up its objectives and established its Secretariat, first in Geneva and then, in 1965, in Vienna. It adopted a ‘Declaratory Statement of Petroleum Policy in Member Countries’ in 1968, which emphasised the inalienable right of all countries to exercise permanent sovereignty over their natural resources in the interest of their national development. Membership grew to ten by 1969. OPEC rose to international prominence during this decade, as its Member Countries took control of their domestic petroleum industries and acquired a major say in the pricing of crude oil on world markets. On two occasions, oil prices rose steeply in a volatile market, triggered by the Arab oil embargo in 1973 and the outbreak of the Iranian Revolution in 1979. OPEC broadened its mandate with the first Summit of Heads of State and Government in Algiers in 1975, which addressed the plight of the poorer nations and called for a new era of cooperation in international relations, in the interests of world economic development and stability. This led to the establishment of the OPEC Fund for International Development in 1976. Member Countries embarked on ambitious socio-economic development schemes. Membership grew to 13 by 1975. After reaching record levels early in the decade, prices began to weaken, before crashing in 1986, responding to a big oil glut and consumer shift away from this hydrocarbon. 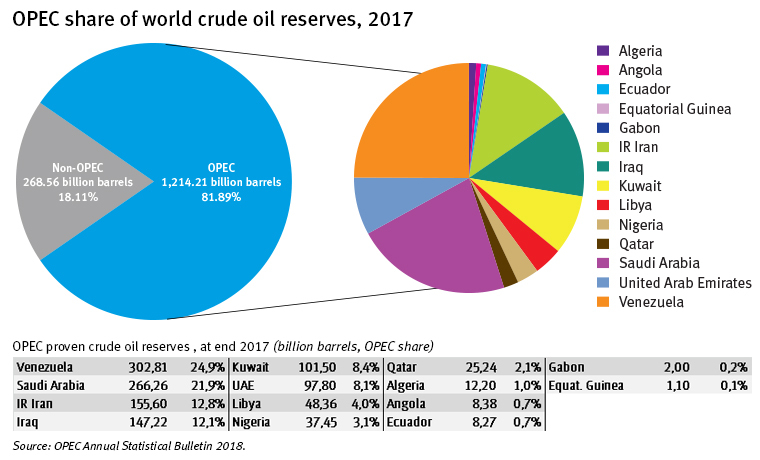 OPEC’s share of the smaller oil market fell heavily and its total petroleum revenue dropped below a third of earlier peaks, causing severe economic hardship for many Member Countries. Prices rallied in the final part of the decade, but to around half the levels of the early part, and OPEC’s share of newly growing world output began to recover. This was supported by OPEC introducing a group production ceiling divided among Member Countries and a Reference Basket for pricing, as well as significant progress with OPEC/non-OPEC dialogue and cooperation, seen as essential for market stability and reasonable prices. Environmental issues emerged on the international energy agenda. Prices moved less dramatically than in the 1970s and 1980s, and timely OPEC action reduced the market impact of Middle East hostilities in 1990–91. But excessive volatility and general price weakness dominated the decade, and the South-East Asian economic downturn and mild Northern Hemisphere winter of 1998–99 saw prices back at 1986 levels. However, a solid recovery followed in a more integrated oil market, which was adjusting to the post-Soviet world, greater regionalism, globalisation, the communications revolution and other high-tech trends. Breakthroughs in producer-consumer dialogue matched continued advances in OPEC/non-OPEC relations. As the United Nations-sponsored climate change negotiations gathered momentum, after the Earth Summit of 1992, OPEC sought fairness, balance and realism in the treatment of oil supply. One country left OPEC, while another suspended its Membership. An innovative OPEC oil price band mechanism helped strengthen and stabilise crude prices in the early years of the decade. But a combination of market forces, speculation and other factors transformed the situation in 2004, pushing up prices and increasing volatility in a well-supplied crude market. Oil was used increasingly as an asset class. Prices soared to record levels in mid-2008, before collapsing in the emerging global financial turmoil and economic recession. OPEC became prominent in supporting the oil sector, as part of global efforts to address the economic crisis. OPEC’s second and third summits in Caracas and Riyadh in 2000 and 2007 established stable energy markets, sustainable development and the environment as three guiding themes, and it adopted a comprehensive long-term strategy in 2005. One country joined OPEC, another reactivated its Membership and a third suspended it.